Dear readers, the team at the LRB is at a loss for words. Over the last 6 weeks, between Barnraisers Club Memberships and Kickstarter, the community pledged $51,006 to our cause. This ranks among the top 3 successful crowdsourcing campaigns for a brewery based in Connecticut! An amazing feat when you consider the new home of the Little Red Barn Brewers has a population of 11,000. Friends, family, co-workers, and our fans came together to help us move our pint-sized dreams forward. We’re excited for the opportunities open to us with this historic campaign. The funds donated will be used to create a tasting room that will pay tribute to the great and rich history of our community and promote the present and the future. Anything is possible when people come together. Northwestern Connecticut is moving in a positive direction – your combined actions have shouted loud and proud, #Winstedhasit. This moment represents another milestone in the revitalization of NW Connecticut. Many came before us and many more milestones await… we can’t wait to see what happens next! There were so many great moments during this campaign, but I am most proud of the money raised for 3 wonderful local charities. With your help, we raised $300 for Open Door Soup Kitchen, $210 for Cancer Care Fund of Litchfield Hills, and $300 for Highland Lake Watershed Association. Together, the community and Little Red Barn Brewers can make a difference in the community we work and live in. 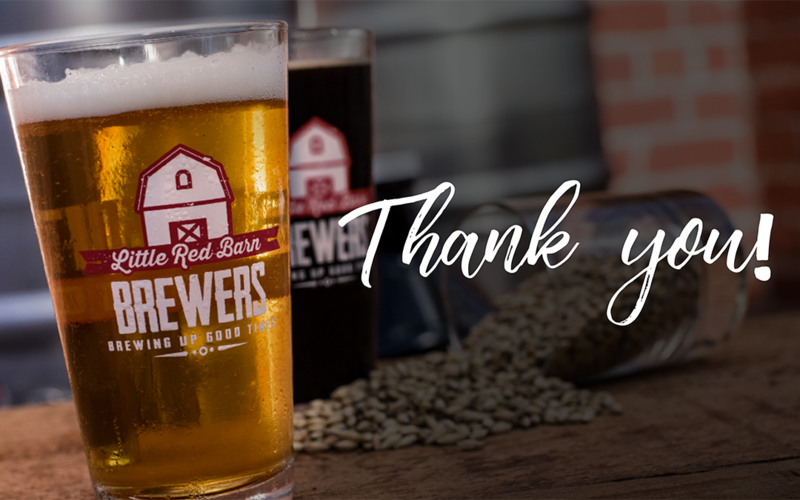 Friends, investors, family, and fans of the Little Red Barn Brewers, we can’t thank you enough for your support. Your work is done… now let the LRB Brew Crew bring this across the finish line. We will work hard not just to meet your expectations, but to exceed them.